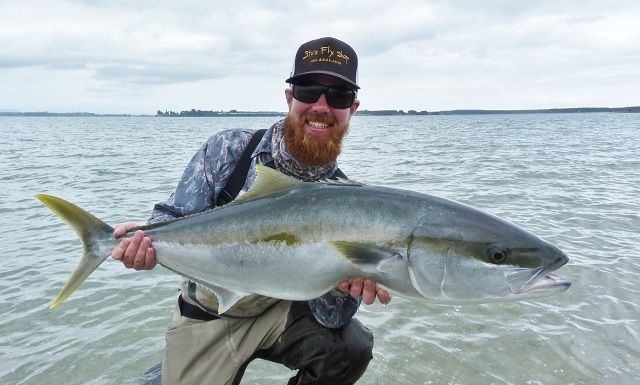 The last few years have seen the emergence of a true world class saltwater fly fishery in New Zealand. 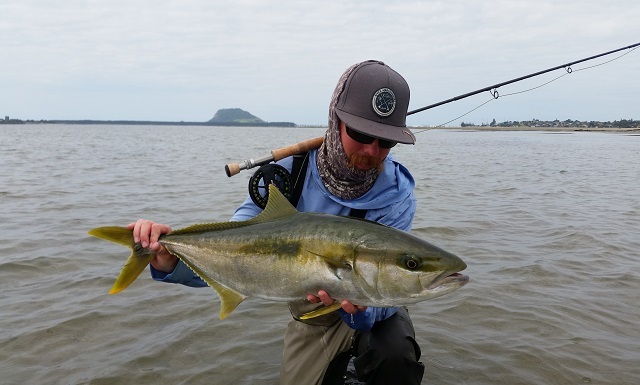 Saltwater fly fishing in the Tauranga Harbour of the Bay of Plenty is where it all started. 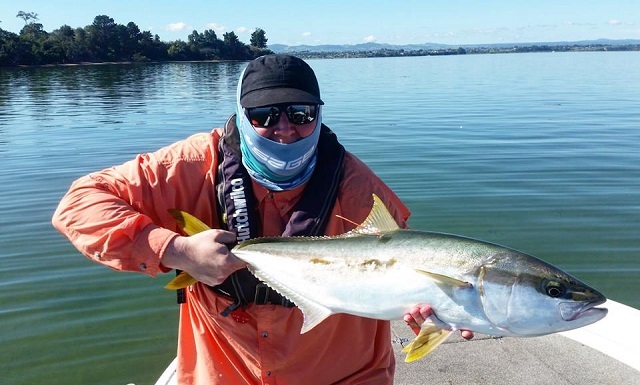 Tauranga harbour is located 50 minutes drive from Rotorua and the base for my saltwater fly fishing guiding operation. 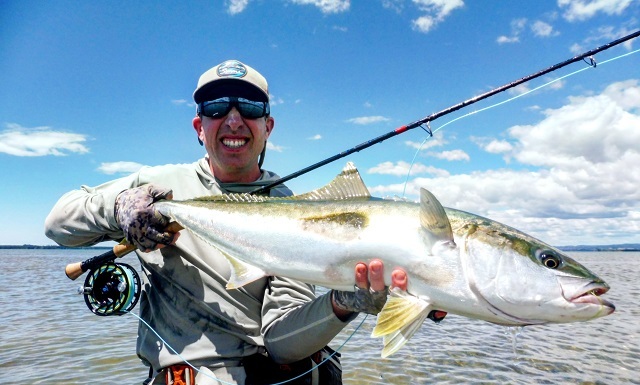 Its hard not to get excited about sight fishing for kingfish in skinny water. 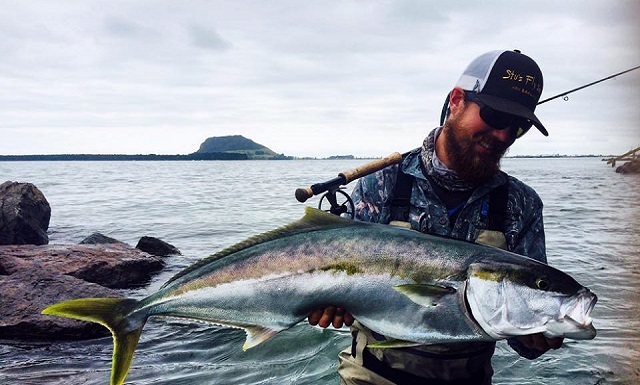 Known for their intelligence, power,explosive speeds and guile in combination with the beauty these fish possess, the kingfish are a true trophy for the international saltwater fisherman. The key interaction that makes this fishery something unique is the relationship between the kingfish and the stingrays that inhabit the coastal harbours and inlets of the New Zealand coastline. 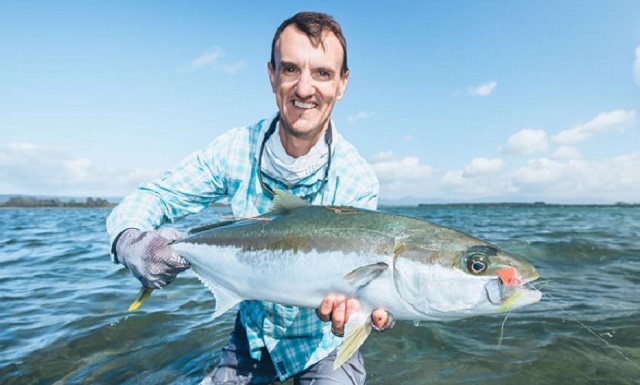 Kingfish follow the stingrays along the tidal flats of the harbours using the disguise of the slow swimming bottom feeders to ambush the bait fish. 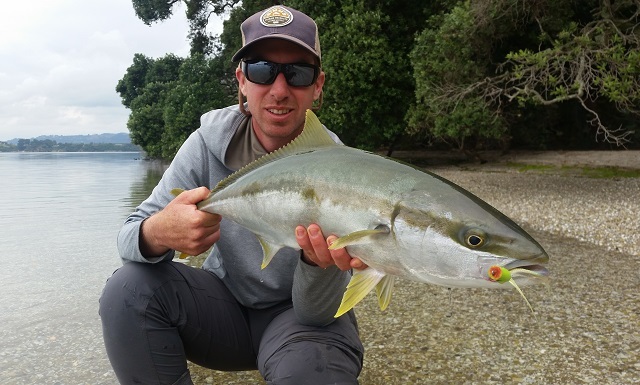 Popular bait fish found on the flats include mullet, herring, piper, jack mackerel, juvenile kahawai and flounder find relative safety of the shallow water on the flats until the low tide pushes them back to the dangerous channel waters for small fish. 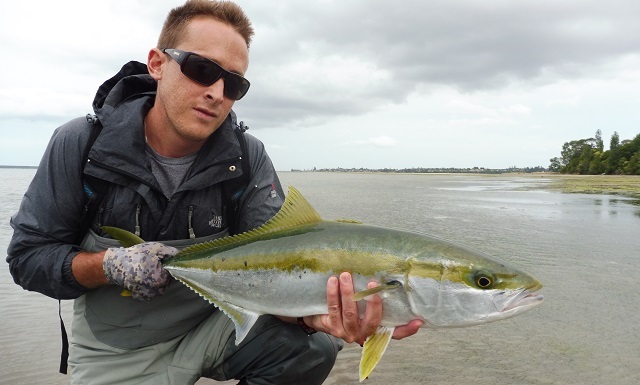 Its when these bait fish are on the tidal flats they become the target of cruising kingfish. The tidal flats characterised by eel grass beds, shellfish beds and eagle ray diggings, at a distance these flats look barren and featureless. Its not until you spend time wading the flats you begin to understand and notice the feature that make this environment to unique. Structure and harbour markers are also great places for kingfish to hang out and ambush the bait fish. 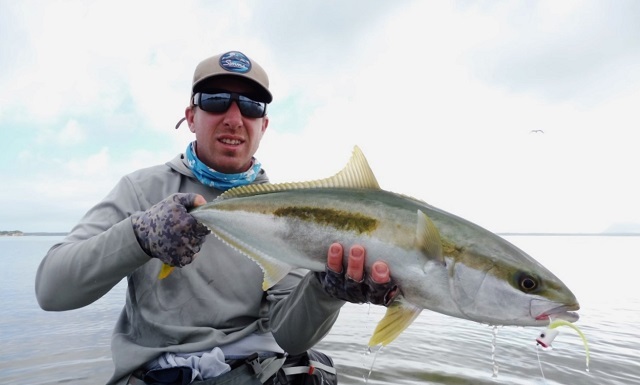 Kingfish can be caught on wet fly bait fish imitations and on top of the surface using popper and crease flies. Just like in the freshwater environment a fish taking the fly on the surface is the ultimate experience, now combine this with the explosive power and fighting ability and you have something very special. 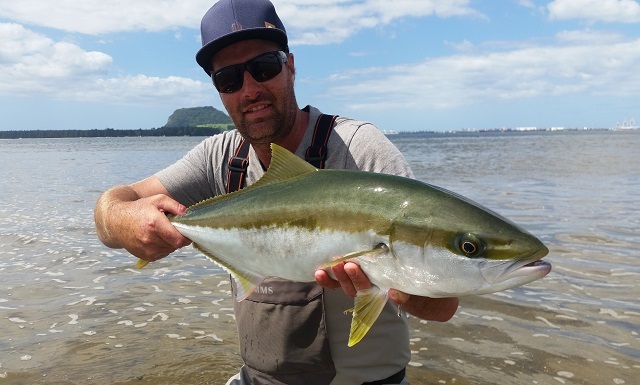 Although kingfish are in Tauranga and the other harbours of the Bay of Plenty all year round, they turn up in the harbours in good numbers by November and hang around well into May. Most of the world kingfish records are from the waters of the Bay of Plenty, New Zealand. 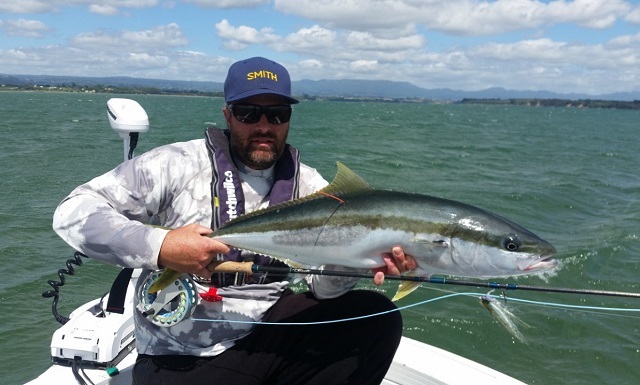 Booking a guide for your New Zealand Saltwater fly fishing trip will ensure your best chance to catch fish. Having a purpose built boat for inshore fishing opens up endless flats and structure in the local Bay of Plenty, NZ harbours. 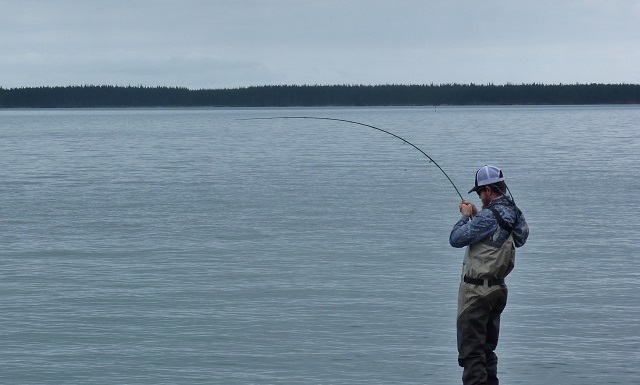 A great way to experience world class guided saltwater fly fishing in New Zealand.